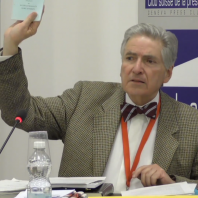 PhD Prof. Alfred de Zayas, independent expert of the United Nations, with mandate for “the promotion of a democratic and equitable international order“, already known for his contribute in favour of the Free Territory of Trieste, i.e. the exclusive invitation of TRIEST NGO to two side events (in September 2017 and March 2018) at the OHCHR in Geneva and his statements claiming the respect of the Peace Treaty of Paris – 10th February 1947, expressed during the demonstration of the Free Territory of Trieste citizens in front of the Palais des Nations on September 15th, 2017 (see video), has announced to the international press, during a press conference held on April 30th, 2018 at the Geneva Press Club –Club Suisse de la Presse, which actions the UN shall undertake towards Italy, in order to establish the Free Port of Trieste. The conference, to which Prof. Alfred de Zayas participated along with Prof. Idriss Jazairy, “Special Rapporteur of the UN Human Rights Council on Unilateral Coercive Measures”, focused on the questions arising from the financial sanctions imposed by USA and European Union to Venezuela, considered by the speakers useless or even dramatic for the citizens experiencing them. The discourse has then proceeded in favour of the right to self-determination of the Catalan people, condemning the accessory disinterest of the EU’s governments and that of the press, which, after the referendum held on October 1st, 2017, have heavily contributed to the severe judiciary and police reaction performed by Mariano Rajoy’s government against the President of the Generalitat de Catalunya, Carles Puigdemont, his ministers and the citizens of Catalunya. Furthermore, as concerning the citizens who have been unjustly prosecuted for the legitimate claim of their rights, de Zayas let the international press know that “There is a self-determination movement in Trieste, and they have – needless to say – also persecuted these people who have been advocating for that” (note: the Free International Port), thus referring to the judicial proceedings executed by the Italian Magistratura (judiciary Court) against the participants of the peaceful demonstration organized by the citizens of Trieste on February 10th, 2014, for the defence of the international area of the Free Port. By saying “also”, de Zayas compares the demonstrators in Trieste, persecuted and prosecuted by the Italian justice for having guarded the entrances to the Porto Vecchio (Old Port), with the earlier mentioned Catalan demonstrators. At the end of the conference, answering to a journalist’s question on the Free Port of Trieste, Prof. de Zayas, as an International Law expert about the question of Trieste and on the Human Rights of its citizens, formulates the best advice to the Italian government on how to act in compliance of the laws and how to give a concrete purpose to the very functions of the United Nations and to the protection obligations towards our Territory. The independent UN expert Prof. de Zayas has successfully launched a flare parachute, thus enlightening the International Law’s twilight zone lying on the Free Territory of Trieste, clarifying it and making it, 70 years later, visible to the media and the international diplomacy. To the clearness of Prof. de Zayas’ discourse contributed significantly – let us say it – the efforts of TRIEST NGO and of all those Trieste’s citizens who, during these years, have strongly believed and fought for the acknowledgment of what the resolution 16 of the United Nations and the Peace Treaty establish. With utmost honesty and pragmatism, Prof. Alfred de Zayas has oriented in a simply manner the feasible solution for the Free Port of Trieste, without futile and misleading interpretations, in full respect of the International Law and in favour of the protection of the fundamental values, wiping off, in one shot, years of untruths, omissions, illegal “sdemanializzazioni” (the act of removing a good from the public property), false “decreti attuativi” and pathetic announcements coming from the incapable, dishonest Italian politicians and administrators. ** ius cogens: the Latin locution ius cogens (in English: compelling law, peremptory norm) refers to certain fundamental, overriding principles of international law, from which no derogation is ever permitted.